The Apostle Paul was an apostle that was "abnormally born" (1 Corinthians 7:8-9). Until Paul's conversion, all of the apostles were selected based on one criteria: they had to have been a part of Jesus' entire three year earthly ministry (Acts 1:21-22). Apparently, though, the Lord had a different qualification. He must have seen something special about Saul (Paul). He saw a passion, a spiritual zeal for accomplishing something great for God. The Lord saw an individual with the right training, the right knowledge, a Jew, and a Roman citizen, who could carry the gospel message across the entire Roman world. But Saul didn't understand the story of Christ. He was too immersed into the sect of the Pharisees to get it. The Lord had to make a special appearance after His ascension to get Saul's complete attention and devotion. You remember the story: as Saul walked along the road to Damascus in order to persecute believers in that city, the Lord appeared to him in order to give him a special assignment. 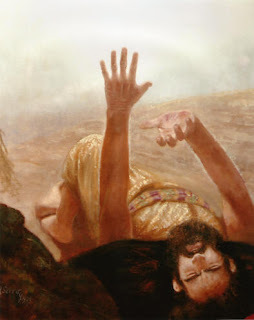 During his personal encounter with Christ, Saul had been blinded, and he was led into the city to await further instructions. The Lord then sent a believer named Ananias to deliver Saul's marching orders for the remainder of his life. The Lord told Ananias that Saul was God's chosen instrument to preach the gospel to the Gentiles, government authorities, and also the people of Israel (Acts 9:15-16, NIV). Right from the start of his conversion, Saul knew exactly what God's Big Idea was for his life. Saul had direct revelation from the Lord regarding what He wanted him to accomplish during his time here on earth. Unfortunately with the close of the New Testament canon, we no longer have direct revelation regarding His specific will for every believer. We must discern His will for our lives through the study of the Scriptures, the Holy Spirit, other believers, and the talents and abilities God has equipped us with. Discerning His will takes time. It takes time in the Word, in prayer, in meditation, and talking to older, wiser believers who can help you in your quest. Perhaps a spiritual retreat is in order for you to understand His will for your life. Sometimes, we understand His full plan for our lives. Most of the time, though, we understand His will a piece at a time. The important thing to remember as each piece is revealed to us is that we must be obedient at each step of the process. Do you know God's will for your life right now? If you are unsure, what do you need to do in order to discover it? If you do know His will, are you being obedient in the knowledge you currently have? Mega Christmas Giveaway Winner| Amazon Kindle! Is having ambition good or bad? Mega Christmas Giveaway | Amazon Kindle!